Blind Fish Found in Gibara, Holguin. By Alexis Rojas Aguilera / AIN / radioangulo. Wednesday, 16 March 2011. Blind fish found in Gibara, Holguin province. Photo: TV Camaguey.The scientific community of Holguin reports the finding of blind fish in some sea caverns in the municipality of Gibara, in the northeastern in the Cuban province, after a search by a team of local speleologists. Jose Corella Varona, the boss of the diving team in charge of scientific explorations of the Holguin branch of the Cuban Speleological Society, said that they found fish identified as fleeing light fishes, of the type dentatus n.sp.Corella Varona pointed out that during an investigation in the flooded caves of El Baga, Cristalitos de Papaya and Dos Anas, nearby the towns of Caletones and Laguna Blanca, in the coastal municipality of Gibara, they found some specimens of the type above described. Corella explained that one of the specimens collected in Cristalitos de Papaya cave attracted wide attention of researches and it is currently being studied as a new specie of blind fish. Corella added that there are four species of Lucifuga fish in Cuba, the so-called subterraneus, dentatus, simile and teresinarun. Currently, there is a fifth under research known as Lucifuga sp and the specimen found in crystalito de Papaya. Corella Varona, with wide experience in investigations of cave systems in Holguin, said previously there were only reports of the caves of El Masio y Tanque Azul, in the same region of Gibara. 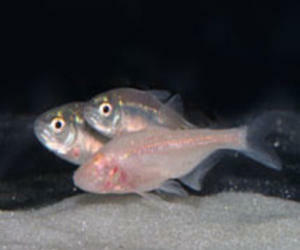 The scientist also explained that the blind fish of the type Lucifuge evolved cave forms from marine ancestors, and that they feed on shrimps and crustaceans that live in the surrounding areas. Juan Carlos Almaguer, a member of the diving team, underscored that these species are also found in lakes and underground cavities, in fresh water from the ocean, and over 90 percent of the reports are located in western Cuba.